Happy Thursday, sweet friends! According to the calendar, spring is officially here. It makes me so happy to see green sprouting out all over nature, pretty flowers popping up, and sweet little birds singing their wonderful songs. These signs of the new season give me a since of renewal and hope. To refresh my home for the change in seasons, I always like to add little seasonal touches around my house…maybe on an entry table, coffee table, or a front porch. I don’t go totally overboard, because honestly I don’t have ample storage to store a lot of seasonal decor. Today, I would like to share with you how I created a quick and easy spring display on my coffee table. My coffee table is often where I place my seasonal vignettes. I prefer to take things I already have on hand and add touches of nature to reflect the season. For this spring vignette, I simply gathered some of my blue and white pieces in varying heights and sizes…a teapot, stack of teacups and saucers, and a little ginger jar. A quick trip to the local grocery store provided colorful flowers for my teapot. I propped my collection atop of couple of my favorite coffee table books to add height and interest to my display. Bunnies always seem to appear around the inside of my house this time of year. This sweet bunny was a gift from Mr. Bleu. I simply tied a blue gingham checked bow around his neck for a little more color and to tie him back to my collection. To complete the look, I added a pretty blue and white platter. This will be the perfect piece to serve guests cookies and other sweet treats. To add just a little more spring to my room, I placed fragrant carnations in an antique cream bottle. The bottle is extra special to me because it is from my grandparent’s dairy farm. I think it adds great interest to place flowers in something other than a vase. I am so happy that you were able to stop by for a visit today. This week, I have been so fortunate to join a wonderful group of ladies to bring you our spring tables. Their talent always amazes me! Be sure to check out their beautiful tables. A schedule is posted below. I know that you will find lots of pretty inspiration for you spring entertaining. Have a happy and blessed day, dear friends, and happy spring!!! I love your blue and white spring display. And Mr. Rabbit is quite the handsome guy! Shannon, what a breath of spring on your coffee table. The rabbit from Mr. Bleu and your blue and white collection welcomes the new season perfectly! I love your sweet flowers and especially the antique cream bottle used as a vase! Beautiful as always, sweet friend! Shannon, your vignette is lovely. However, I am most likely partial because I love blue and white and yours is so pretty. Mr. Rabbit makes everything spring and he is quite the handsome guy. Also, every time you show your gorgeous red toile chair, I love it just a little more. If that is possible. Lovely post- have a great weekend. Hope you are beginning to see signs of spring. This is just a stunning post! 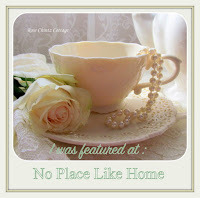 I have featured you at TFT today. Happy Easter!